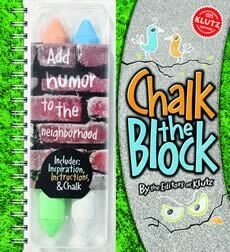 Chalk the Block comes with 4 big pieces of chalk and a ton of bold ideas for adding temporary humor to the sidewalks, curbs, walls, rocks, and bricks of your neighborhood — colorful antics, caricatures, and tomfoolery, with a few extreme hopscotch grids thrown in. Tickle the funny bones of friends and strangers with inspired lunacy guaranteed to bring a smile to passersby. It's fun to do, fun to see — and it's temporary!